Expert insights on lapidary techniques. Topics on the science of minerals, and faceting. Short and interesting articles, projects and puzzles for kids. The go-to source for field trip destinations. Guide to in-depth examinations of minerals and gem materials. Not sure what to do with the gems from your last field trip? Step-by-step projects for lapidaries of all skill levels will soon have you tumbling, polishing, faceting, and making jewelry like a pro. Regular columnists William A. Kappele, Steve Voynick, and Jim Perkins share their insights on lapidary techniques, the science of minerals, and faceting. We know that our youth are the key to continued growth in the hobby. 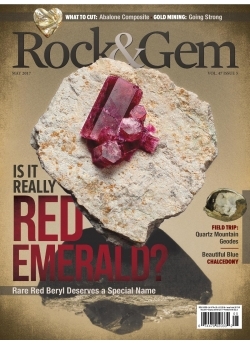 Our monthly children’s feature, Rock & Gem Kids, is designed to appeal to a younger generation with short, interest-catching articles, kid-sized projects, puzzles, and a chance to win a prize.